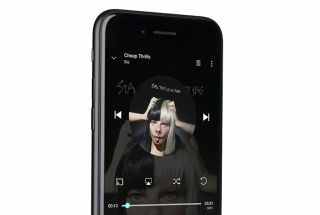 Anniversary iPhone to pack a bigger screen into the same-sized handset | What Hi-Fi? For the iPhone's 10th anniversary, Apple is rumoured to be testing a handset that's the same size as the iPhone 7, but with a similar-sized screen to the iPhone 7 Plus. This year marks 10 years since the iPhone launched, and to celebrate, Apple is reportedly planning to launch three new models of iPhone, details of which have just been leaked. According to Bloomberg, Apple is testing an 'anniversary' edition of the phone that packs a screen the same size as that of the iPhone 7 Plus, but in a handset the size of the standard iPhone 7. Apple is also testing integrating the home button into the screen, similar to Samsung's Galaxy S8. The special anniversary edition could also feature an OLED screen, which is currently being tested by Apple, while the standard two models will stick with LCD screens. According to the report, Apple has dropped the curved screen from the special anniversary edition. It had tested a model with a curved panel, but reports suggest that suppliers struggled to mass produce the display. Instead, Apple has reportedly ordered 100 million OLED panels from arch rival Samsung to use in the new iPhone. Previous reports claimed that the anniversary edition - dubbed the iPhone X - would sell for around $1000 (£780), making it the most expensive iPhone ever made. It should launch in September, but might not be available for purchase immediately due to problems in sourcing parts, according to Bloomberg.